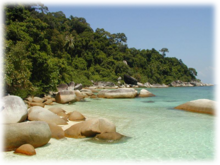 Additional Info: There are 80 national parks in Thailand. The north of Thailand is mountainous, with the highest point being Doi Inthanon at 2,565m (8,415ft). 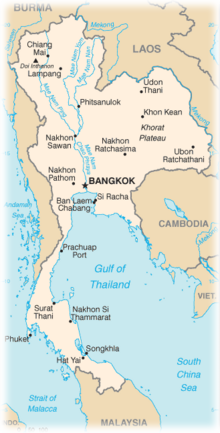 The northeast consists of the Khorat Plateau, bordered to the east by the Mekong river. The center of the country is dominated by the predominantly flat Chao Phraya river valley, which runs into the Gulf of Thailand. The south consists of the narrow Kra Isthmus that widens into the Malay Peninsula. 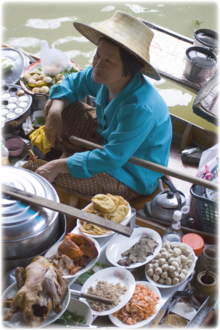 The culture of Thailand incorporates a great deal of influence from India, China, and the rest of southeast Asia. Theravada Buddhism is central to modern Thai identity and belief. OK, so I've had a lot of fun looking at my Thailand Guide Book and remembering my backpacking travels from a few years ago. This is how we did our trip: We flew into Singapore, traveled up through Malaysia and into Thailand from the south. We spent the last few days in Bangkok. Kuala Lumpur (Capital of Malaysia) - I didn't like this place very much because it was a big urban sprawl. We only spent a day there, it's worth a fleeting visit but I wouldn't spend too much time because it's busy and dirty and expensive. I remember that our hotel was pretty much a slum! Kuala Lumpur has developed into an international shopping destination with a wide variety of shopping centers and mega malls, which carry well known global and local brands. It has 66 shopping malls and it is the fashion hub for Malaysia. 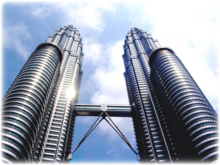 Kuala Lumpur is also home to the Petronas Twin Towers - the world's tallest twin buildings. We traveled by bus from Kuala Lumpur to Melaka (dubbed as The Historical State), which is, by contrast, a lovely old city, really colorful, kinda European. It's quite small and I think we were there for one evening, which was fine. After a brief stop in Kota Bharu (state capital and Royal City of Kelantan) by bus, we went on to Penang, which was quite nice and had a massive market. 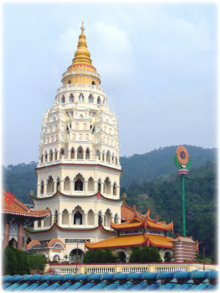 Penang ranked as the 10th most livable city in Asia in 2007. The best way to capture Penang's mixed heritage is to stroll around town. Be charmed by aged buildings with their faded colors and crumbling walls. Let your eyes be affixed on the slowly changing architectural details of yesteryear houses with their columns or multi-colored Peranakan tiles. From Penang we went on to the Pulau Perhentian (Perhentian Islands, 10 miles offshore from the coast of northeastern Malaysia), which were absolutely fantastic. You get a boat to the Islands, chose which one you want to stay on and simply walk up to one of the hotels on the island. The accommodation is in huts (fairly basic with en-suite facilities) but the place is idyllic - white sand, clear blue sea, you can snorkel or learn to dive etc. It's beautiful. The only set back is that the islands are Muslim so alcohol is a little scarce. From the Pulau Perhentian we spent a day traveling (where we used almost all forms of transport, in order: boat, taxi, walking across the Thai/Malaysia border, train, van, bus, motorcycle) to Krabi, which is a nice fairly large, seemingly easy-going city with nice shops and markets. We then got a small local bus to Ao Nang which is on the coast. Ao nang is really nice, it's well catered for with loads of small Thai restaurants, shops, markets, bars etc.. and is not too touristy either. I had the scary experience here that a lady boy waiter(ess) winked at me! Most alarming! From Ao Nang you can buy day-excursions to various places such as Ko Phi Phi (which is where "The Beach" was filmed) and tours around James Bond and other film shoots. Climbing is another activity widely available through centers in Ao nang although most of the climbs are actually in the areas around Railay, Tonsai and Phra Nang beaches. Ao Nang was actually my favorite place of all the trip. we stayed in a grand hotel on the beach for absolute peanuts (we felt very scummy in relation to the hotel, but we were practically the only people there!) and there was a fab bar on the deserted beach we were near, and you could have massages on the beach. It was absolutely fantastic. The only problem is that this place might have been affected by the Tsunami, although I'm sure you'll be able to find lots of places to stay nearby, and I'd be really interested to hear how it is now. So, Ao Nang is on the mainland, but you can also stay for a few days on resorts on the Islands. We then traveled by bus and then boat to the Island of Ko Samui. I didn't like Ko Samui too much because it was really touristy and reminded me of Spanish holiday resorts with loads of English-themed bars and restaurants. I kind of figured if you're in Thailand it's nice to be as far away from all that as possible. It was a bit of a shock after Ao Nang. We hired a car in Ko Samui and it was quite nice to be able to explore the island. We found an ace fish restaurant where you chose your fish and they cook it for you (not so good for my veggie friend, who ate a bean salad that evening!). There's a big gold Buddha and a bizarre mummified munk (wearing sunglasses!) so it is quite interesting, but I wouldn't particularly recommend it - there are a lot nicer places to visit. We then flew from Ko Samui to Bangkok. There's loads to do in Bangkok. We stayed in Koh San Road, and there are loads of restaurants and bars (and travelers!) there. Also see the Grand Palace, which is beautiful: The king's official residence is the Grand Palace, which dates to 1782 and has housed Thailand's monarchs for over 150 years. It is one of the most visited locations in Bangkok. Within the complex is the Chakri Mahaprasat Hall and Wat Phra Kaew, which houses the Emerald Buddha and is considered the most important temple in Thailand. Chitralada Palace is the Bangkok residence of King Bhumibol Adulyadej (Rama IX) and Queen Sirikit. » The reclining Buddha is quite cool (Wat Pho): Wat Pho, which houses the Temple of the Reclining Buddha or Wat Phra Chetuphon, is located behind the Temple of the Emerald Buddha in the Grand Palace. It is the largest temple in Bangkok and named for its huge reclining Buddha measuring 46m long and covered in gold leaf. The Buddha's feet alone are 3m long. » Wat Arun is nice. The outstanding feature of Wat Arun is its central prang (like a tower). Steep steps lead to the two terraces. The prangs are decorated by seashells and bits of porcelain which had previously been used as ballast by boats coming to Bangkok from China. Around the base of the prangs are various figures of ancient Chinese soldiers and animals. Over the second terrace are four statues of the Hindu god Indra riding on Erawan. » The Floating Markets are worth a visit too, although I got the feeling that the one we visited had been created for the tourists, and that there was another "genuine" one hiding around the corner, which is used by the locals! Most stuff we did in Bangkok was pretty touristy, there are other places you can visit too if you research (although if it's the first place you go you might just need to relax and absorb the culture!). » Carmel recommends: the Chatuchak weekend market - it's massive, so need to get a taxi/skytrain to the entrance you want. This weekend market in Bangkok is the largest market in Thailand, and largest of the world. Frequently called J.J., it covers over 35 acres and contains upwards of 15,000 stalls. It is estimated that the market receives between 200,000 and 300,000 visitors each day. Most stalls only open on Saturdays and Sundays. 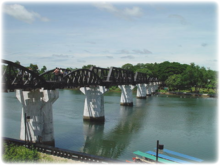 » Outside of Bangkok, Carmel recommends Kanchanaburi - a great place for getting into the country/mountains that's only a short (relatively) train ride out of Bangkok. See some monkeys/do some river rafting/elephant riding etc. We'd stayed at 'Sam's Guest House'.